We all want more love. Not even getting the perfect relationship can guarantee you’ll have enough. Couples who’ve been together for years don’t always feel loved the way they’d hoped. Getting more love in your life doesn’t start with changing your man, or even getting a man. It starts with changing how you think about love. Dr. Barbara De Angelis asks a provocative question in her latest book, The Choice for Love. “What if we could be in love all the time?” she wonders. What if love isn’t something you get … but rather something you are? I’ve often been intrigued by the disconnect between how loved someone feels and the quality of their relationship. I’ve met women who feel absolutely adored, despite the curt or even rude way they’re treated by their men. I’ve also met women who feel emotionally abandoned, despite having a husband who cares deeply and tries his best. Dr. De Angelis has an intriguing explanation for this. She suggests that inside each of us is an ocean of love. Sometimes this ocean rises up like a great wave, overwhelming us with joy. Sometimes the waters recede, leaving us feeling empty and alone. The ebb and flow of our own emotions are what makes us feel loved sometimes and not at other times. From this perspective, no one can give you love—or take it away. The love you feel is always your own. This is such an empowering metaphor. It helps us visualize the truth that love is an inside job. If you decide that you’re going to fall in love with your life, just as it is, then no one can stop you. So what if one particular man doesn’t return your affections? You still have an entire ocean of love inside you. 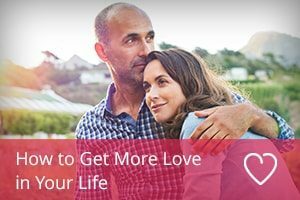 Your quest shifts from finding a relationship that will give you the love you don’t have … to finding out what causes that mysterious surge of love inside your heart. So try this. Get curious about why you feel love at certain times and not others. Can you remember the last few times you felt that rush of love? What was happening? Who were you with? What were you thinking about? To help you on your quest, here are 3 love triggers. They pave the way for an overwhelming sense of love in your heart—with or without a man. When you take time to feel grateful, you open a gateway to love. Take a moment to think about the things about your life you’re truly grateful for. Consider how lucky you are, and how privileged you are, to have those things in your life. Sit with that feeling of gratitude until it fills your heart as well as your mind. Notice how close it feels to love? Just as love expands your heart to include another, so belonging expands your heart, until you become part of something much bigger than yourself. It’s hard to feel lonely when you know you belong. So find your tribe. Maybe it’s your family of origin, or the friends you’ve known since school. Maybe you can find your people through work, your passions, or your faith. Allow yourself to feel that great surge of pride and affection that comes from knowing you belong. To fill your life with love, give your love away. Find as many things to love as possible. Let your own love fill your heart, instead of waiting for someone to fill it for you. Think of someone you can give your love to. Maybe it’s a friend, or maybe it’s someone who needs it, even though you don’t know them very well. It doesn’t even have to be another person. Maybe the beach needs your love, because it’s covered in trash. Maybe an animal needs your love, such as those at the local animal sanctuary. Maybe you are the one who needs love more than anyone. Then do something loving. Let that person, place or thing know that someone cares. Ultimately, no one can fill your heart with love like you can. Commit to filling your own heart, and the right relationship will add to your life (instead of saving you from it). This entry was posted in Dating, Relationships and tagged finding love, how to find love by James Bauer. Bookmark the permalink. Well written. I think this is one of the reasons why some people fail to to fall in love. And when they find true love,they dont know how to embrace it. They end up saying things like,”there is no such thing called true love, oh noone can love me better etc”. You have to love yourself first,to know what love is and be wiling to love others the way you want to be loved too!